The Love & Lemons Meal Record and Market List is the prettiest meal planning journal you've ever seen! Plan your meals, grocery lists, and social events! 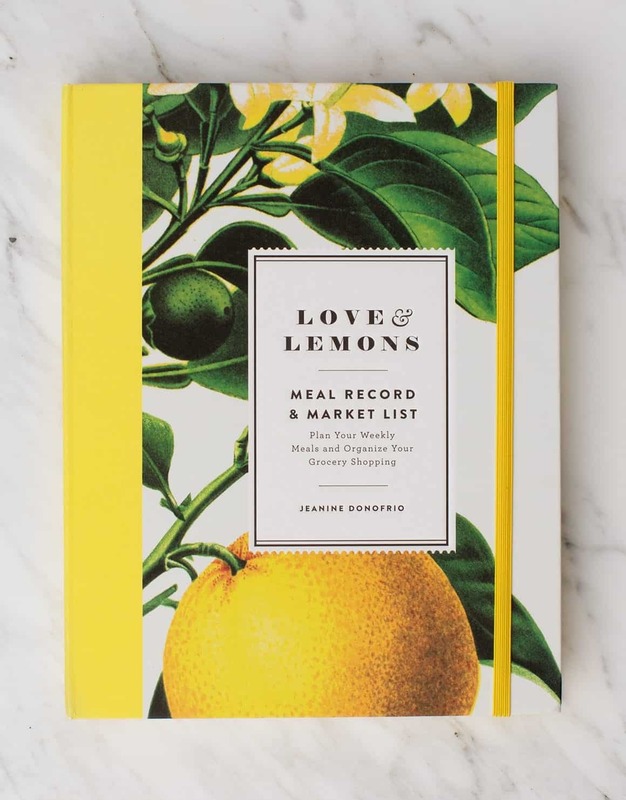 Meet the newest member of our L&L family: The Love & Lemons Meal Record and Market List! Also known as the prettiest meal planning journal you’ve ever seen (of course I’m biased). This is for all of you who LOVE to meal plan… and also for those of you who think you might want to start meal planning (raising my hand), but were just waiting for the perfect pretty book, with letter-pressed type on the front, to record all of your wonderful plans and goals. When you open up the hardcover case, it looks like this (below). The pocket on the left holds the removable journal and the market list fits into a pocket on the right. This lets you easily record your meal plans and make your grocery list at the same time. Inside the journal, there are 52 weeks worth of personal meal planning pages. They’re not pre-dated so if you don’t plan your meals every single week, that’s ok! There’s space to plan your breakfasts, lunches, dinners, snacks, and treats for every day of the week. There’s also some handy info at the front, like this Grains & Legumes cooking cheat sheet. I personally always forget how long I cook my quinoa, and now I can just check my meal journal instead of looking it up online. In the back, there are 7 pages for planning social gatherings – you can jot down your guest list, menu plans, wine/cocktails, and inspiration in this area. So there you have it! This comes out next week on April 3rd, but CLICK HERE to go preorder it now! Ahhh! So exciting I love meal planning! I can’t wait to pre-order. The Lemon’s got me! I just per-ordered! thanks Miriam!! Means SO much! Oh my gosh this is BEAUTIFUL!! 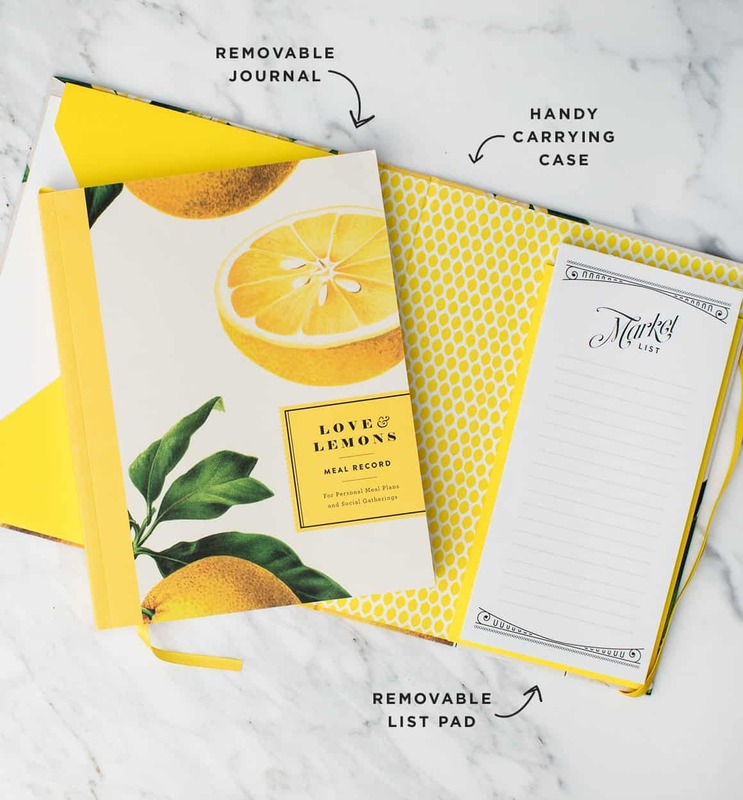 I am so glad this journal is in existence because I feel like this is something that everyone can use, but no one was really filling the need for it before. Pre-ordering now!! so happy to hear that, thank you, I hope you enjoy it!! I just pre-ordered mine as well. Yeah! How have I lived without something like this?? The layout is perfect. An idea though: not all of us meal prep for Monday –> Sunday. Having no set dates is great but having no set days would have been even better. I meal prep for Wednesday –> Tuesday these days because that’s what goes best with my schedule but it does vary according to what’s going on. I’ll keep my eyes open in case a “blanker” version comes out. I saw this on your Instagram in my feed. I immediately thought I need one of these. I don’t really meal plan as it don’t really work with my schedule traveling for work regularly. But for the time I’m at home and weekends I always forget what I’m shopping for as well need something to write in to remember food ideas or what I planned to cook etc. This will be great to have and maybe get my sister one who somewhat meal plan a bit. I can see taking this to the grocery store and it’ll look great too in my shopping cart. Can I order this one? So cute! Why you didn’t launch it before Easter :-)? What a great resource, Jeanine! Thank you for all the thought you’ve put into this. It’s an organized yet simple and flexible formula. This will be top of my list to share with clients, as I’m often discussing the benefits of meal planning and prep as a tool for not only eating better but cooking more as well! Such a great idea! LOVE the look! By the way, I’ve noticed this on other food related blogs as well. Any idea why all fellow food bloggers use tiny fonts instead of larger ones? Hi Codrut, thank you! Can you let me know which font specifically you’re having trouble reading? Mine just arrived in the mail!! So excited to use this gorgeous planner. Will share on my social media and tag you when I do..
thanks as always for your great ideas!! This is so cute and perfect for keeping everything on track.